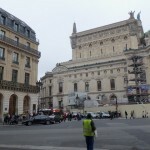 Everything in Paris is a mixture of style, luxury, perfume, great food and cigarette smokers. 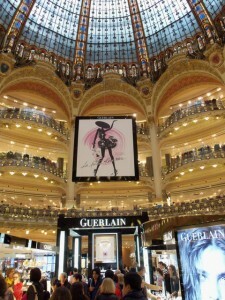 There is of course history in each building and the department store, Galleries Lafayette (more photos) is no exception. 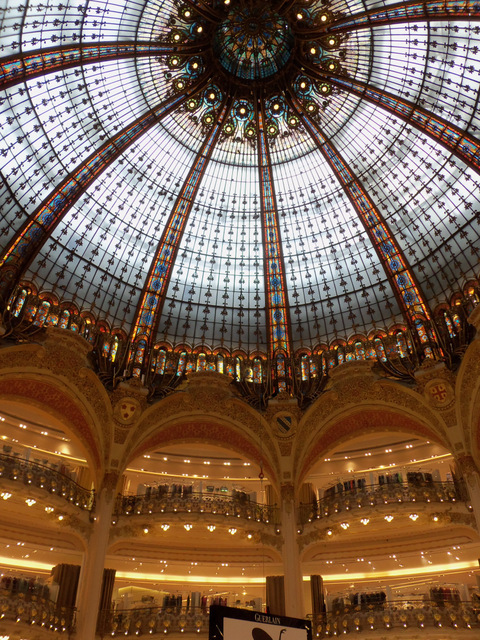 Purchased in 1896, the beautiful glass and steel dome was designed by architect, Georges Chedanne and his pupil Ferdinand Chanut and finished in 1912. Only in Paris will you find a museum that covers the history of perfume. 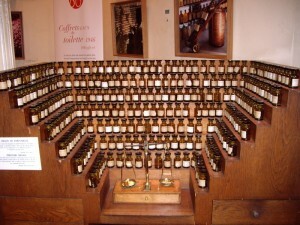 I discovered the “Musée du Parfum” also known as the Fragonard Musée du Parfum. This museum was created in 1983 by the Fragonard perfume company within a Napoleon III town-house (built 1860.) I was not allowed to take photos inside the museum, however, here is a photo of the orgue à parfum (perfume organ) with tiers of ingredient bottles arranged around a balance used to mix fragrances. 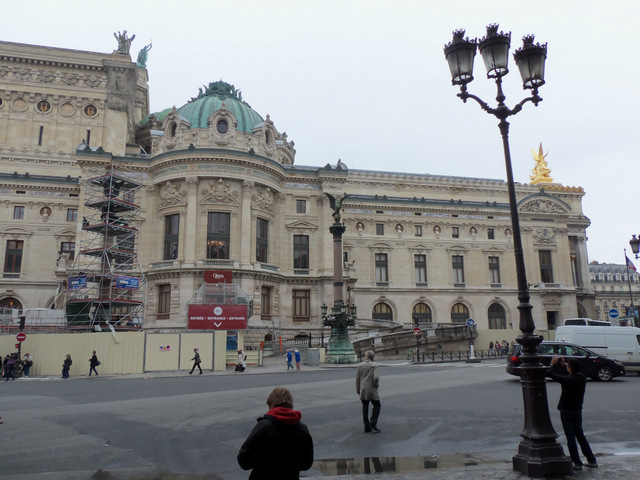 The museum sells perfumes and is located close to the Place de L’Opéra. As you can see, we’re wearing winter coats in May 2013. 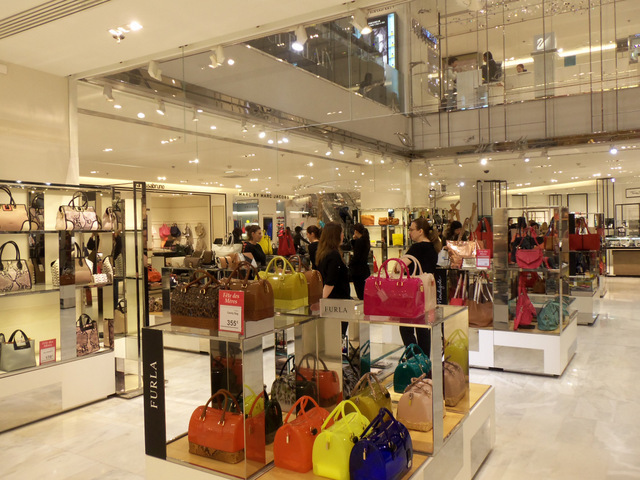 And finally the beautiful upscale store “Printemps.” I have never seen so many Chinese tourists buying Luis Vuitton, Chanel and other luxury goods. At the Chanel store, a rope blocked the entrance, and the women were only allowed to go in two at a time. The look of anticipation on their faces reminded me of kids waiting for their favorite ride at Disneyland. I heard it’s the same at Harrods in London. 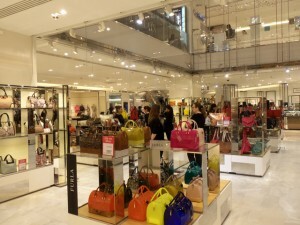 Do you like shopping at luxury stores? I don’t feel comfortable in this type of environment. Sonia, I’m with you on feeling out of my element in those stores. At least today I can enjoy looking. That was not always the case. Nearly fifty years ago my grandmother-in-law took me to the fur floor in Wannamakers in Philadelphia, just to look. I was sure I’d be struck by lightning! Poor girls (or so I thought I was at the time) had no business in such posh surroundings, and Grandma was far from rich! I was relieved that the snooty looking sales woman decided to ignore us. Then, to my horror, Grandma didn’t seem to notice the fact that we were being royally snubbed, and greeted that painted lady with the warmest hello and sunny smile, beginning a conversation about how beautiful the furs were. Though my gut remained frozen, the woman began to thaw, but fortunately Grandma looked at her watch and realized we were due to meet the rest of the family in 90 seconds. Phew! Thanks for the video tour. My daughter and her girls are heading for Paris for a month in July. I’ll send the link to give the girls a preview. Sharon Lippincott recently posted..How Do I Start Writing My Lifestory? I’ve never heard of a store called, “Wannamakers.” What a strange name. I started taking photos and video outside the Chanel store and a man came yelling towards me in French to stop taking photos. I’m sure your daughter and her girls will have a wonderful time and great weather. There might be a heat wave, as it seems temperatures are becoming more extreme today. Thanks for letting me know I’m not the only one to feel uncomfortable in these super high-end luxury stores. I’m looking forward to hearing about your trip to Italy later this year. It sounds as though you’re still having a wonderful time Sonia. Good ! I don’t think you’ll find Harrod’s just allowing two people in at a time, it’s much too busy for that. David Prosser recently posted..The Social Set and Friendships. They only allow two people at a time into Chanel, from the tour bus of Chinese/Japanese tourists as I heard they buy so many luxury items and return to China to sell it. Not sure if that’s the real reason. My daughter and I visited both stores when we were there. We looked but, of course, couldn’t afford to buy. My 11-yr-old declared that these posh places weren’t for her! She prefers simpler places as do I. We did, however, have a fabulous meal in the Japanese restaurant at the top of the Galleries Lafayette! 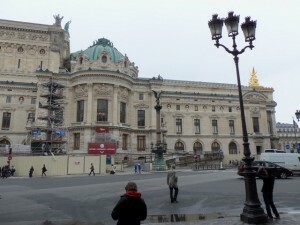 I missed the Japanese restaurant at the top of Galleries Lafayette, but I did eat in a traditional French restaurant. I don’t like to ship luxury stores in the U.S., as a rule. 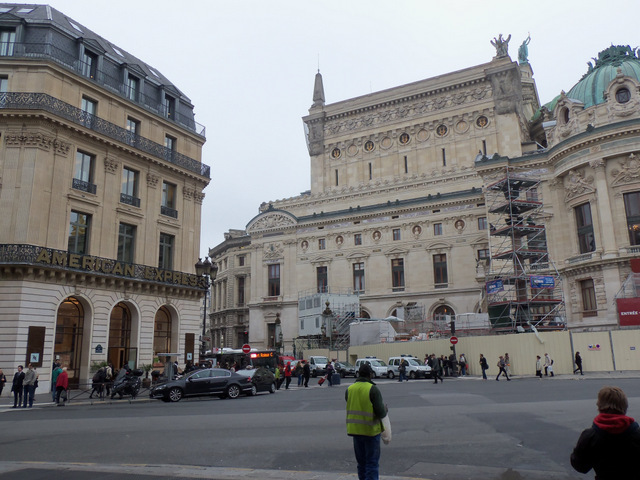 But Galleries Lafayette in Paris–that’s different! I LOVE that store; what an experience! I actually prefer the feel inside Galleries Lafayette. A bit less pretentious than Printemps.